The HMT-2260 Manual Rotary Microtome offers a sleek, but sturdy, straightforward instrument for sectioning of paraffin embedded tissue. The HMT-2260 Manual Rotary Microtome is a cost-efficient and compact unit designed to meet the microtomy needs of all standard histology laboratories. The smooth counter-balanced hand wheel allows freedom of control but limits fatigue. The wheel may be locked in any position. The universal cassette block holder with self-contained level affords versatility and multiple angle adjustments for different tissues or embedding demands. The coarse advance wheel allows a controlled approach for efficient trimming. The section thickness window is easily viewed and adjusted on the front of the instrument. 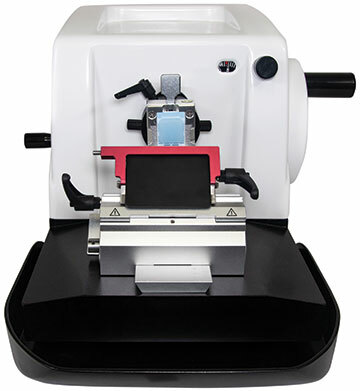 The HMT-2260 Manual Rotary Microtome includes a knife holder that allows for the use of either low profile microtome blades or high profile microtome blades. The knife holder has smooth lateral movement to utilize the full length of the cutting blade. The knife stage slides easily onto the dovetail base. The dovetail base has gradation markings on the right side so that the desired position of the knife stage may be precisely identified. For added safety, the knife holder comes equipped with an attached knife guard to cover the blade when the instrument is unattended. The knife guard also contains an ejecting pin mechanism for safe and simple removal and disposal of blades. The knife clearance angle, 0 - 10°, can be adjusted on the knife holder base. A waste tray slides effortlessly under the front of the unit, magnetically held in place and easily removed for cleaning. The Dovetail Base Knife Stage has gradations for identifying the exact position of the Knife Stage. 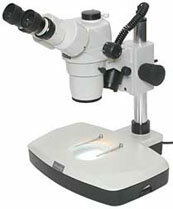 28158 HMT-2260 Manual Rotary Microtome each P.O.R. 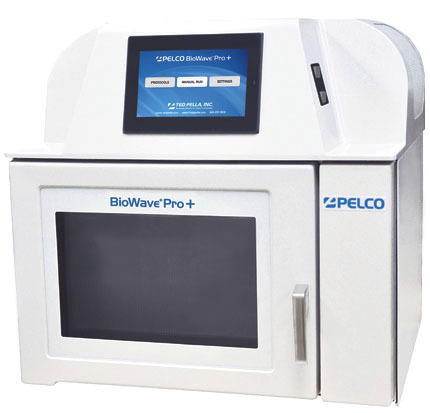 Our glass Tissue Floatation Water Bath has been developed using microprocessor controls and a modular design that has improved reliability and precision. The unit is low profile with a removable rectangular glass basin for easy cleaning. The glass basin is illuminated by LED light from the side allowing clear observation without glare against the black background. There is an ON/OFF switch on the control panel for the LED light. Temperature settings are controlled by push buttons for accurate and precise control and the easy to read LED displays show both set temperature and actual temperature. The corrosion resistant, stainless steel temperature probe flips down into place. The probe has a thermostat sensor inside that turns off when it is lifted up and re-starts when placed back into the basin. Microprocessor controlled with heated, non-drip spigot. 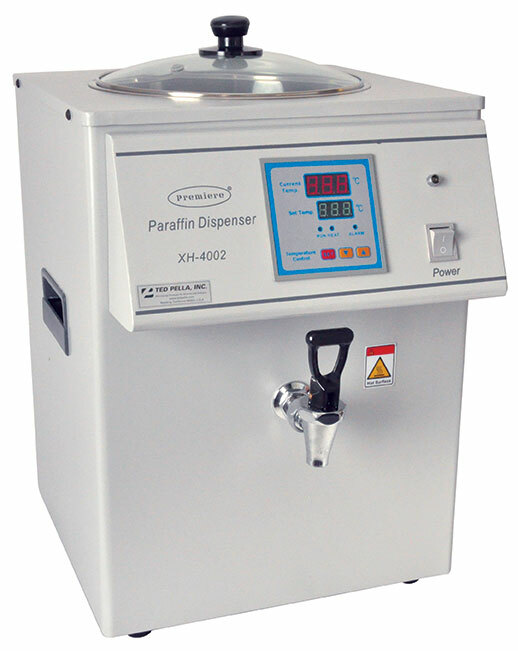 A clear lid permits easy viewing of paraffin without contamination. The durable stainless steel interior is easy to clean. It features a built-in temperature controller that allows setting the temperature from room temperature to 72°C (162°F). 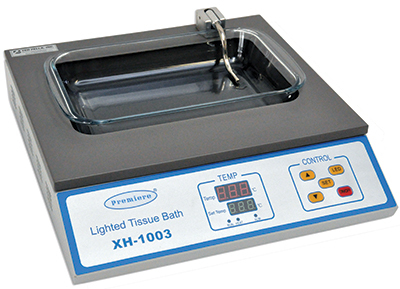 Our Block Wax Trimmer is an efficient appliance for removing excess paraffin from embedding tissue cassettes. This wax trimmer can be used with all sizes of biopsy and mega cassettes. The grooved, heated surface channels melted wax into a removable collection tray that stays in place at the base of the unit by magnetic contact. Disposable plastic liners are included to insert inside the collection tray for easy disposal of the runoff wax. There are two heat settings on the side of the cabinet; low is approximately 80°C (176°F) and high is approximately 100°C (212°F). 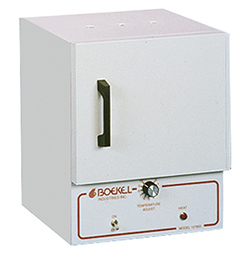 Compact slide warmer with digital temperature control and LED readout is ideal for quickly drying slides for the small histology or research lab. The slide warmer surface holds up to 24 slides. Overall dimensions are 10" x 7" x 3" (25.4 x 17.8 x 7.6cm). 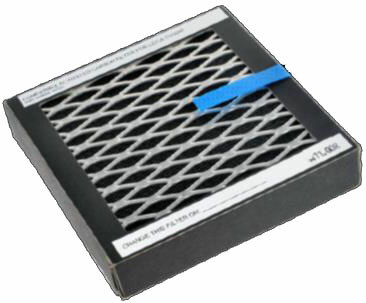 Cover provides for drying of slides in a debris free environment. 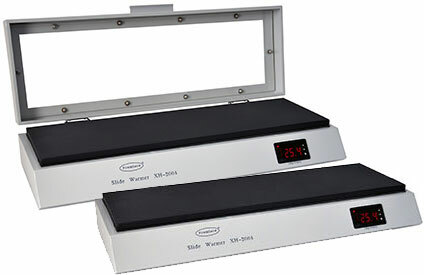 The large slide warmer provides the larger histology or research lab a tool for drying paraffin sections in minutes in order to perform routine staining or immunohistochemistry. 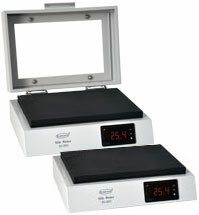 The slide warmer is equipped with a digital temperature control and LED readout. The slide warmer plate holds up to 56 slides. The overall dimensions are 25" x 8" x 3" (63.5 x 20.3 x 7.6cm). 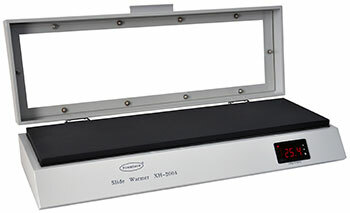 The Step Up™ Slide Warmer has a unique design to save space and assist in efficient handling of a high volume of slides. The Step Up™ holds twice the number of slides as a flat unit of similar dimensions. The overall dimensions are 14" x 14" x 4" (35.5 x 35.5 x 10.2cm) with digital temperature control and LED readout. 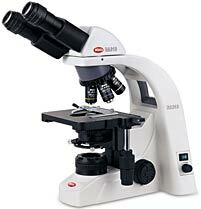 The Mini Section/Slide Dryer has a small footprint designed to be used at the microtome for improved LEAN workflow. 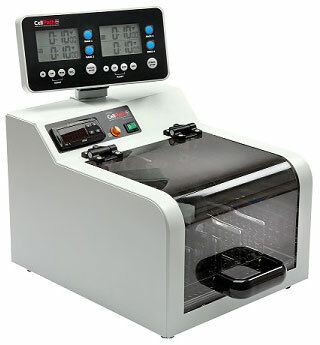 Air at a digitally controlled temperature is blown through the base of the instrument for rapid and efficient section drying without the risk of overheating the specimen. With this system, drying times can be reduced by approximately 75% compared to conventional ovens. 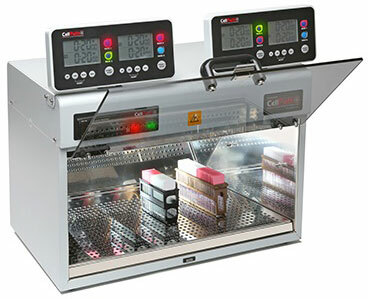 A large chamber has space for up to 6 slide racks (30 slide capacities), which can be inspected at any time through a transparent lid. Innovative resistance hinges on the lid allows users to easily position it at any angle. This allows both hands to be used when placing and removing items from the dryer. With the optional 4 Slide Rack Holder in place, the capacity is 4 slide racks of 30 slide capacity. The optional LEAN Timer system and identifier rack ensures that each slide rack has an exact optimal drying time and provides both an audible and visual indication to users when a slide rack has fully completed drying. 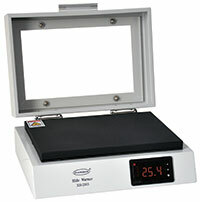 The LEAN Timer can monitor up to four slide racks. The High Capacity Section/Slide Dryer is like the Mini Section/Slide Dryer but larger in size to accommodate twice the volume of slides. Designed to give maximum drying capacity for high workload laboratories, the High Capacity Section Dryer has space for up to 13 slide racks (30 slide capacities). When two 4 slide rack holders are used, capacity is 8 slide racks holding 30 slides each. 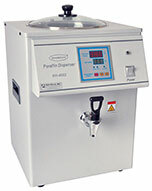 28149 High Capacity Section/Slide Dryer, 110VAC, 50-60HZ 400 Watts each P.O.R. 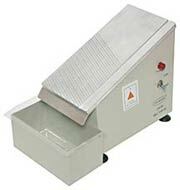 28149-230 High Capacity Section/Slide Dryer, 230VAC, 50-60HZ 400 Watts each P.O.R.